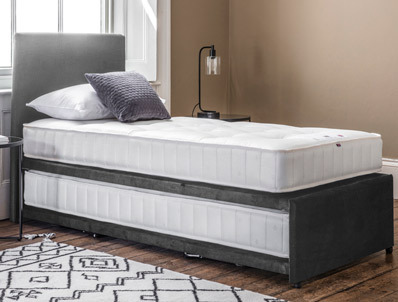 The Superior Trio Guest Bed from Gallery direct comes as standard as a coil spring mattresses but can be upgraded to a 1000 spring count pocket spring mattresses both of which are easy care non turnable . The coil spring mattresses have a quilted top , whilst the pocket mattresses are hand tufted . Each mattress contains luxury white fibre and have flag stitched handles and chrome vents. The bases of the bed top and bottom are available in any of the 36 Gallery upholstery fabrics . You can choose from small single 72cm wide x 196cm long or standard single 90cm x 196cm . The Headboard pictured is not Included in the price but can be added as an extra either as a Magda headboard on legs or a Margo Floor Standing Headboard .